CSP and EQIP are two of the largest programs in the conservation title of the farm bill, both in terms of acreage and spending. They are considered “working lands” programs in that they provide direct assistance for conservation on land that remains in farming, as compared to a program like the Conservation Reserve Program (CRP) which rents acreage out of production for 10 to 15 years. Working lands conservation programs are particularly important for natural resource challenges such as reducing nutrient losses from productive farm fields (see, farmdoc daily, April 7, 2016; March 17, 2016). Figure 1 illustrates the Congressional Budget Office (CBO) Baseline estimates for outlays from these two programs during fiscal years (FY) 2019-2028 (CBO April 2018 Baseline). In short, CSP provides financial assistance to farmers meeting threshold levels of conservation on the entire farm through a five-year contract. In return for annual payments, the producer agrees to maintain current conservation practices and increase or improve conservation across the farm during the five years of the contract. By comparison, EQIP provides direct financial assistance by sharing the cost of adding, maintaining, or improving conservation practices. Under current law, 60 percent of all EQIP funds are designated for livestock operations. H.R. 2 proposes to eliminate CSP entirely, however, existing contracts would continue through the end of the respective five-year contractual term. H.R. 2 also proposes increasing the funding for EQIP. In addition to an increase in funding, H.R. 2 proposes that up to 50 percent of the funds available in EQIP are for new stewardship contracts; the remaining funds would be available for traditional EQIP cost-share assistance. The 60 percent of funding for livestock operations is eliminated in H.R. 2. 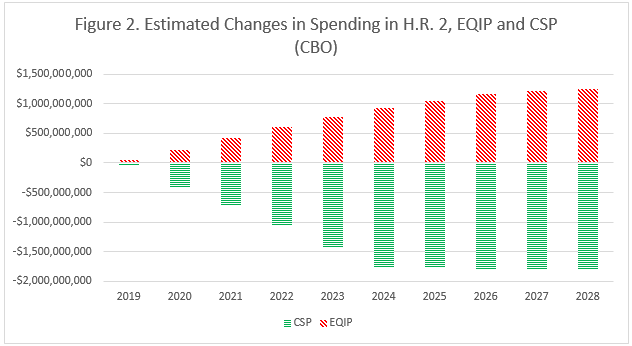 Figure 2 illustrates CBO’s estimated changes in direct spending from these changes (CBO May 2, 2018). CSP is an acreage-based program; the 2014 Farm Bill required USDA to add 10 million acres to the program each fiscal year (through 2022) but manage the program to achieve a national average cost per acre of $18. Acres were to be allocated to the individual states based on the state’s proportion of eligible land and consideration of conservation needs. By comparison, EQIP provides a fixed amount of mandatory dollars each fiscal year, beginning at $1.35 billion for FY 2014 and increasing to $1.75 billion in FY 2018. The statute does not require any specific allocation of the EQIP funds to the states. As a result, states receive different allocations of funding from the two programs. 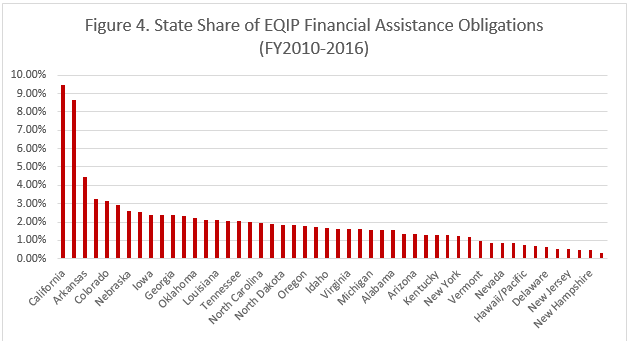 Figures 3 and 4 illustrate the state-by-state share of financial assistance obligations from CSP and EQIP, respectively, using Natural Resource Conservation Service (NRCS) Data for FY 2010 through 2016 (NRCS, RCA Report-Program Reports). The state-by-state impact of H.R. 2 on EQIP spending is not as straight forward. The FY 2010-2016 allocations in Figure 4 are impacted by the statutory requirement that 60 percent of the funds go to livestock operations. H.R. 2 eliminates this requirement, while adding stewardship contracting authority to EQIP and limiting its funding to 50 percent of the total allocation. 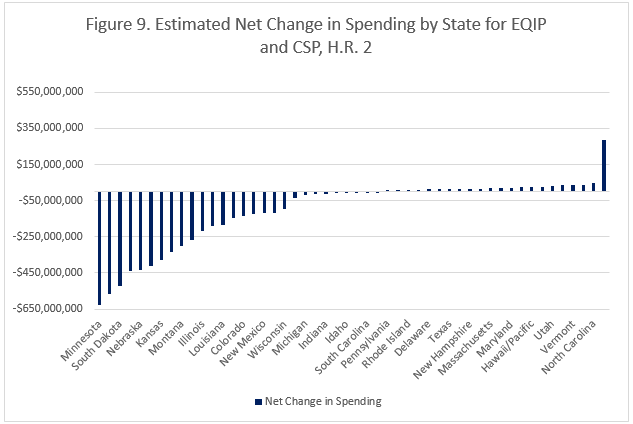 Figure 8 estimates state-by-state spending under EQIP as revised by H.R. 2, applying the FY 2010-2016 State shares for CSP and EQIP (Figures 3 and 4) to 50 percent each of the total EQIP funding as increased by H.R. 2 according to CBO. The estimates in Figure 8 operate under the assumption that stewardship contracts would be allocated similarly to CSP and the remaining 50 percent of non-stewardship EQIP funds would be allocated similarly to EQIP in the FY 2010-2016 period. 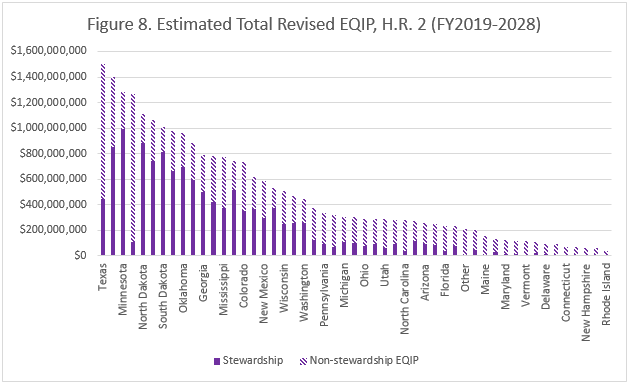 As such, each state’s estimated total consists of different levels for stewardship and non-stewardship EQIP; for example, most of Texas’ funds (70 percent) come out of non-stewardship EQIP while most of Minnesota’s (78 percent) come out of stewardship contracts. 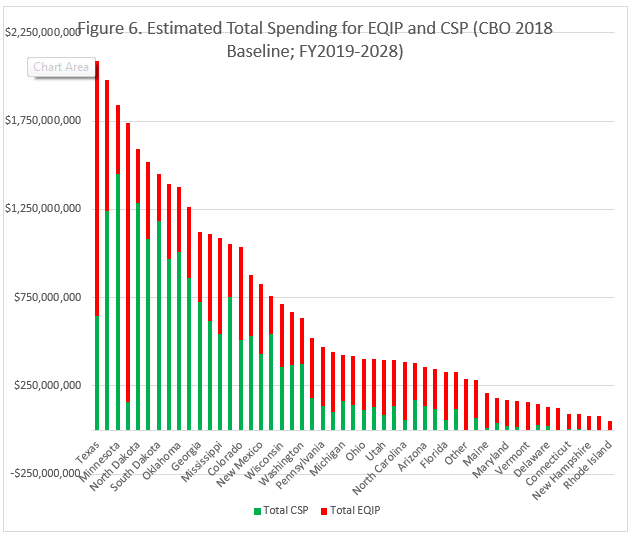 Figure 9 provides a final perspective for this analysis; illustrating the estimated total change in spending for CSP and EQIP by state for the ten-year budget window (FY2019-2028). H.R. 2 proposes to eliminate CSP which decreases spending in that program (Figure 7) while increasing spending in EQIP (Figure 2). To estimate the state level impact of these changes, Figure 9 uses the same EQIP calculation in Figure 8 (2010-2106 CSP share for 50 percent of the scored EQIP increase plus 2010-2016 EQIP share for 50 percent of the scored EQIP increase) and adds it to the estimated decrease in CSP by State. It illustrates an estimated shift in funding from those states that have previously received higher allocations under CSP to those that have previously received higher allocations under EQIP.